Even feuding clans can't keep their passions at bay. Forced into marriage by their king in order to stop years of inter-clan feuding, Sorcha Campbell and Malcolm MacGregor are each determined to drive the other away. Malcolm knows he can never trust his new shrewish wife, despite the fact that everything he observes seems to prove that she’s not only trustworthy, but utterly perfect for him. Sorcha knows she can never let her guard down around the man she believes betrayed her father, yet the longer she’s with him, the more she discovers he is nothing like she was led to believe. They’ll have to fight their way through past prejudices and their own determination to destroy their union in order to gain their perfect HEA in this Taming of the Shrew meets How to Lose a Guy in 10 Days tale. He’d backed her up against one of the four posters of the bed and she bumped against it with a little squeak. Instead of pushing him away, though, she raised her impertinent little nose in the air. She smiled up at him. Her sweet smile momentarily caught him off guard. Her gaze dropped to his lips and lingered before slowly traveling back to meet his own and the heat in those eyes hit him like a fist to the chest. She rose up on tip toe and trailed one finger along his jaw line. Sorcha shook her head and bit her lip and most of the blood in his body rushed south. She looked up at him through a thick fringe of lashes, her sparkling blue eyes staring deep into his. A quick, gasping breath had her breasts straining against the laces of her dress. She placed her hands on his chest…and pushed him as hard as she could, her foot lashing out to connect sharply with his leg. He stumbled backward and she escaped, storming toward the door. Malcolm hopped back until he collided with the bed and sat down heavily. The door to the outer chamber slammed and he started laughing. Finally, he lay back and flung his arm over his face. “What am I going to do wi’ that woman?” he said. 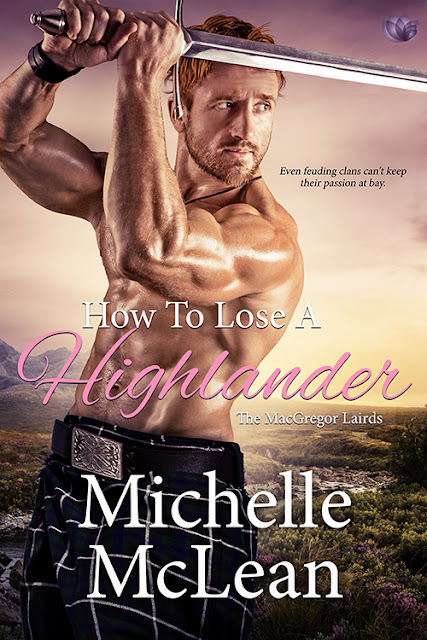 Michelle McLean is a jeans and t-shirt kind of girl who is addicted to chocolate and Goldfish crackers and spent most of her formative years with her nose in a book. She has a B.S. in History, a M.A. in English, loves history and romance and enjoys spending her time combining the two in her novels. 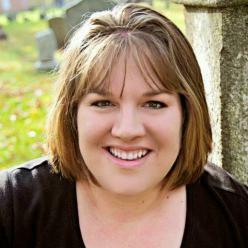 When Michelle's not editing, reading or chasing her kids around, she can usually be found in a quiet corner working on her next book. She resides in PA with her husband and two children, an insanely hyper dog, and three very spoiled cats.